Completely renovated and located in Caravilla Estates, the only complex in Penticton where you own the land. Just move in, all the work has been done! Plenty of windows make for a bright living/dining area that also has a sit-up breakfast bar. New stainless-steel appliances. Two bedrooms - the large master opens onto the back deck. Den and two bathrooms. New covered, very private back deck has a natural-gas BBQ outlet. Newly fenced back yard with a row of grapes and two sheds. 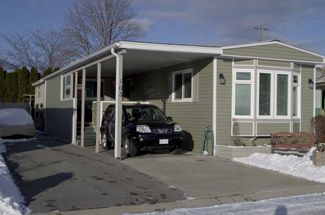 Single carport and tons of additional parking - even room for your RV! Brand new siding and soffits, updated windows and interior doors. Private covered front porch. Great location just minutes from Skaha Lake beach.